For a minute there, I thought I was having a fitness identity crisis. 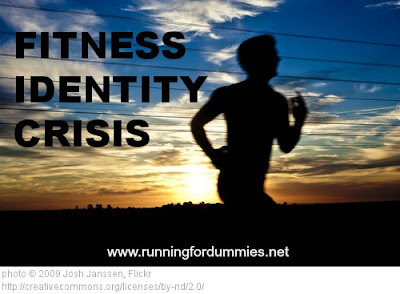 I identify myself as a runner. I am a runner. I love running. I love racing. My blog is called RUNNING for dummies. This is what I do. This is what I love. Except I haven’t been running much at all lately. I've been averaging 10 miles a week. The old me would scoff those miles, the old me ran 10 miles a day! I've been running for about 10 years. I came to the realization about two years ago (I’m a slow learner) that in order to become a better runner, I needed to get stronger. I joined a boot camp and started doing some strength training. I would do boot camp several days a week, then run several days a week, still focusing on putting in as many miles as possible. This went on for a year or so (on and off) until the beginning of this year when I decided to start a more serious weight lifting program. Boot camp was great and brought me far, but it was time for the next level. It was time to say good-bye to the 8-10 lbs. weights at boot camp and start to lift heavy on my own to get stronger! Over the next 12 weeks, I lifted heavier, ran less, got much stronger, and to my surprise, became a much faster runner. I lifted weights 3-4 days a week and ran 3-4 days a week (doubling up some days). I liked weight lifting much more that I thought that I would, but after several months of the same routine, I started to get bored. I progressed to the point where I couldn't advance to the next level without some professional help. No, not from a psychiatrist silly, from a personal trainer. I wasn't interested in getting injured, and I didn't have the comfort level to go there alone. After about six months, I started to lose my motivation to get up at 5am to hit the weights. I was missing more and more of those morning work outs. I knew it was time for a change, but what now? I knew strength training was important, I knew that (just) running alone would never be enough anymore. I was proud of the muscle (abs, hello!) and the speed that I gained and I wasn't willing to lose them. This is when I decided to do Insanity. Insanity was the first program that I ever did where I wasn't able to incorporate running into my routine. Insanity was a 6 day a week program and was pretty intense. I was committed to following the schedule to the letter. During the first month, when the work-outs were easier (easier. Ha!) and shorter, I would get in about 2 runs in a week, but once I moved into the second month’s longer and more intense work outs, I was lucky to run once a week. I missed running but I knew this was only a nine week program. It was OK to take a temporary break. Insanity, without a doubt, made me stronger. Much Stronger. The proof is in my before and after fit tests. But interestingly, my running pace slowed slightly (15-30 seconds a mile). I guess if you want to be a good runner, you have to actually run! I finished up Insanity and was so proud of myself! It was really hard and I saw it through to the end, but I was ready to start running again. What was next? My fitness style is that I have to be involved in a program or I have trouble with commitment. I have to have a written schedule for a set amount of time and follow it to the letter. I can’t just decide on a whim every day what I will do, or frankly I will probably end up doing nothing. Maybe I should repeat Insanity? Yes, that is what I would do. I talked about it online. I even did the first two work-outs. Wait, no, maybe I should try P90X instead. Yes! Rather than repeat what was known (Insanity), I would venture into the unknown with P90X. Last Sunday night I planned to start P90X on Monday morning, but then I stayed up too late with a bottle of wine over-slept the very first morning. Instead, I woke up Monday morning to a text from my friend asking me if I would be interested in joining her CrossFit box. It was a great deal and I was intrigued. Maybe this was the next level that I was looking for in my weight training earlier this year. I could work with trainers, lift heavy weights, and get stronger. Less than 12 hours later I was starting my first CrossFit on ramp class. My new CrossFit experience started this week (yikes!) and I am paid up until mid December, at which time, I can decide if I will continue with it or move onto something new. I am committing to 5 days a week at 5:30 am. It is going to be tough. Really tough. I am going to try to incorporate some easy leisure runs into my evenings for enjoyment, and a long run on the week-end to train for the San Antonio Rock 'N Roll Half in November. So maybe I not having a fitness identity crisis after all. I am a runner. A runner who has a passion for hitting the pavement, for long runs, for slow runs, for fast runs, and for hills. Yes, I said hills. I will never again be that runner who logs 50+ miles a week, but just because I will not be running as much these days, it doesn't make me any less of a runner. I just happen to be a runner who does other things. I am a runner forever, even when I am not running. As I mentioned elsewhere I loved Insanity. I do believe the only way to be successful long term is to plan a month to 3 months ahead of time on your workout schedule otherwise it is just to easy to punt. Make a plan and work the plan. Include days off as well or optional days. I also have plans that merge Insanity and P90X together. I can't wait to hear about your Crossfit experience. Haven't tried it, but want to. It is very effective article with the information of runningfordummies.net world wide.It is a fairness website for all the people.Now a days we are to know many matters by this site,Really,I like this site. It is well written and effective also it is very informative. I really feel so good after reading your content AS I like to share Personal trainer sacramento, Weight Loss Programs, Knowing the best workout routines, Healthy Meals and Guides, keep your health and fitness levels high with Ken Karnacks 25 years of expert advice and help.